, is lined not with hotels but uninspired, hemi-high rise apartment buildings . Here and there some of the town’s beautiful old-world architecture still holds out, but you’ll have to venture one block inland to get a taste of authentic Blanes. We’re talking about both architecture and food. Matter of fact, lets take care of the food first, and we’ll cover architecture in a later entry. Parallel to the boulevard, but one block inland, lies Passeig de Dintre. Sundays excepted, each morning this is home of a fabulous fresh fruit and vegetables market . When the market is over the place gets cleaned up and become the terrain of pedestrians and terraces. 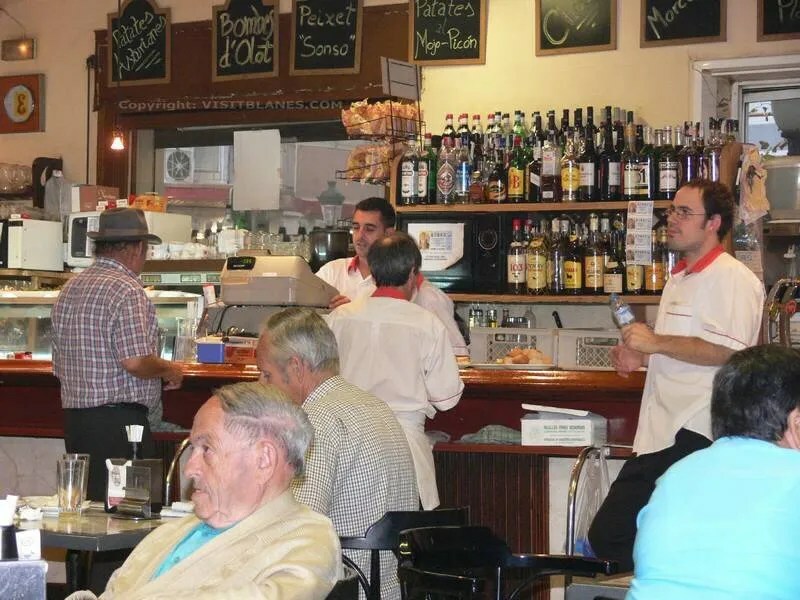 The most popular terrace is the one at Café Terrassans — an authentic tapas bar, over 50 years old, that is frequented by locals and tourists alike. Calamares a la Romano is the most popular of its many specialties, but the 50+ item tapas menu (in six languages) includes many other seafood and non-seafood items. Inside you’ll find a large, high-ceilinged dining hall that breathes history. In the cellar of this building one can see remainders of an old city wall. The name of the cafe itself refers to a union of farm workers whose offices used to be located in one of the rooms above the bar. At the time there were two cafes here. They were merged in 1931. In late 2006, the bar was renovated to bring it up to modern standards. The most eye-catching change is that a section is walled off with floor-to-ceiling glass, in order to provide smokers with a place of their own. Other than that, most of the features that give Terrassans its authentic atmosphere have luckily been preserved. We highly recommend Cafe Terrassans for its food, drinks, service and atmosphere.